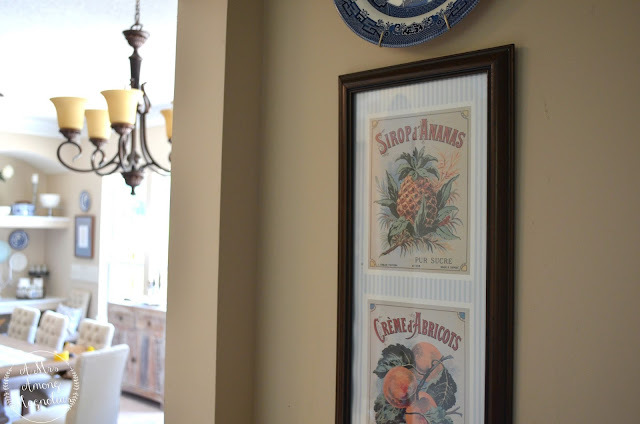 Pineapples have been viewed as a symbol of hospitality since Christopher Columbus first encountered the pineapple in 1493 on the Leeward island of Guadeloupe, where the local people placed pineapples in their doorways as a sign of welcome. Well, welcome to my home! There are plenty of pineapples here, and I am sharing a few of them with y'all today. Enjoy! This past weekend my parents had an impromptu sleep over at our house, so the next morning my mom and I went out antique/thrift store shopping. By the end of the morning, we were tired and ready for a Dunkin Donuts sweet peach tea(THE BEST! 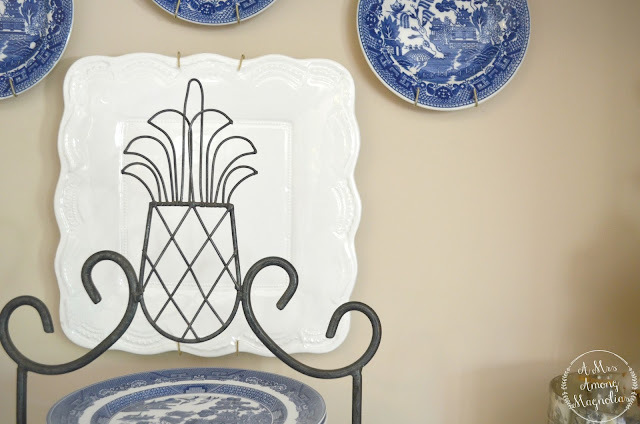 ), but we stopped in one more shop and I found this pineapple plate rack for $20! 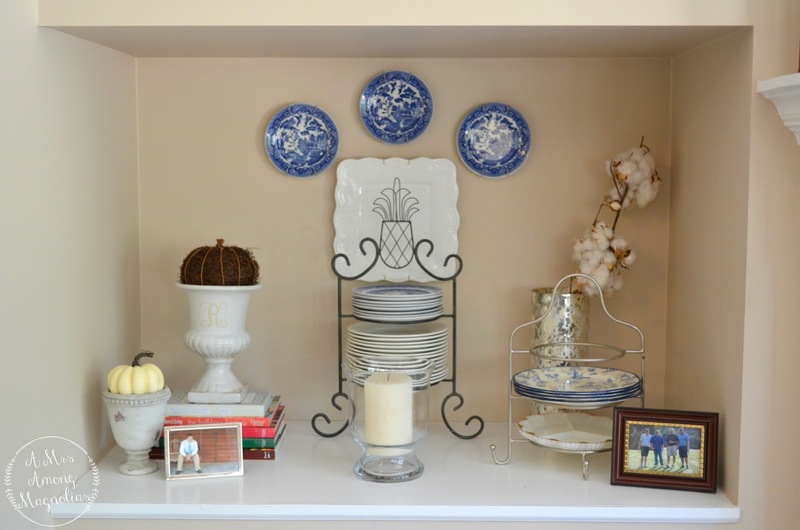 It is about 2 feet tall and it fits perfectly into the built ins in our dining room. 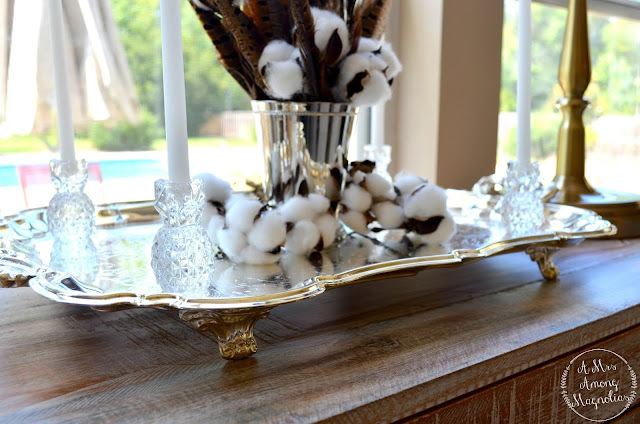 Sadly, it only hold salad or dessert plates, but it is still pretty cute! Also in the dining room, I have these pineapple taper holders from Williams Sonoma. They are no longer in stock, but there are multiple pairs for sale on eBay. When the sun starts to go down in the evenings these reflect the light all through out the room. 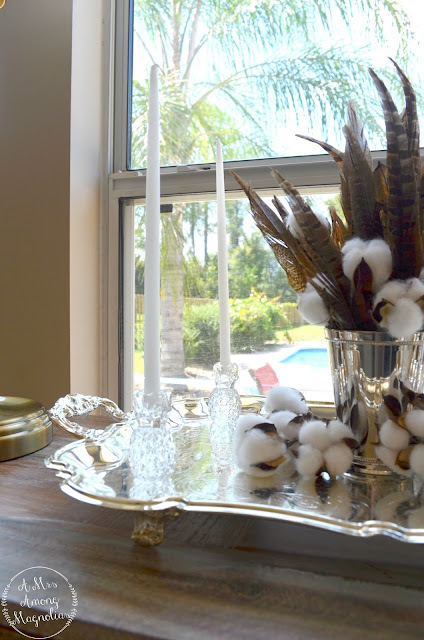 PS- If you ever purchase candle holders similar to this from Williams Sonoma, make sure that you also purchase a box of tiny tapers to go with them. These are very skinny, and I haven't seen them anywhere else before. This is probably one of my all time favorite goodwill finds! I found this print in this frame for $3! We recently had a new goodwill open near us about a month ago, and in that month I have found 3 pineapple items. This picture, a pineapple rug and a pineapple cocktail napkin holder. My other find from this past weekend, was this rug! 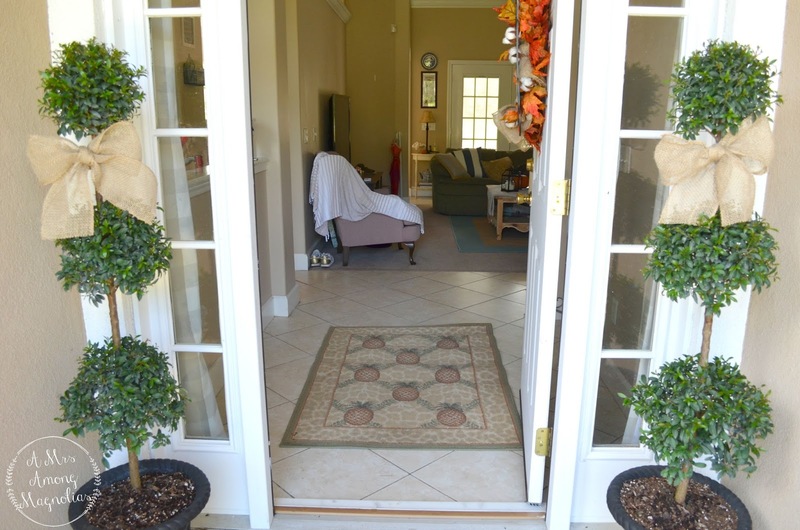 I have been looking for a rug for our foyers and this one fits perfectly. 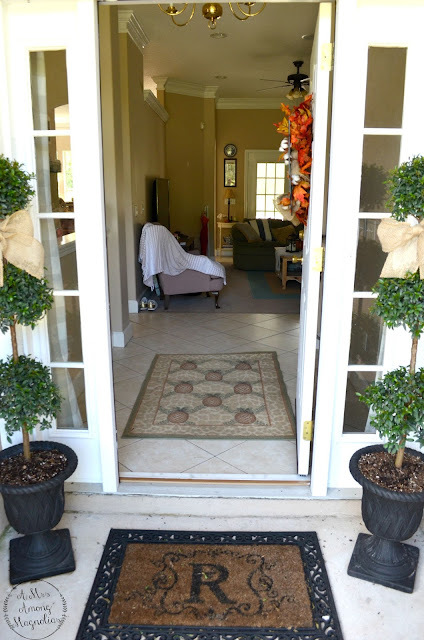 I hope it welcomes many people into our home. 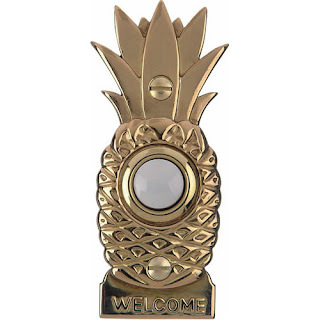 Now that I have this pineapple rug in the foyer, I think the next thing I need to get is this pineapple doorbell! I love that it says welcome at the bottom. How adorable is it! 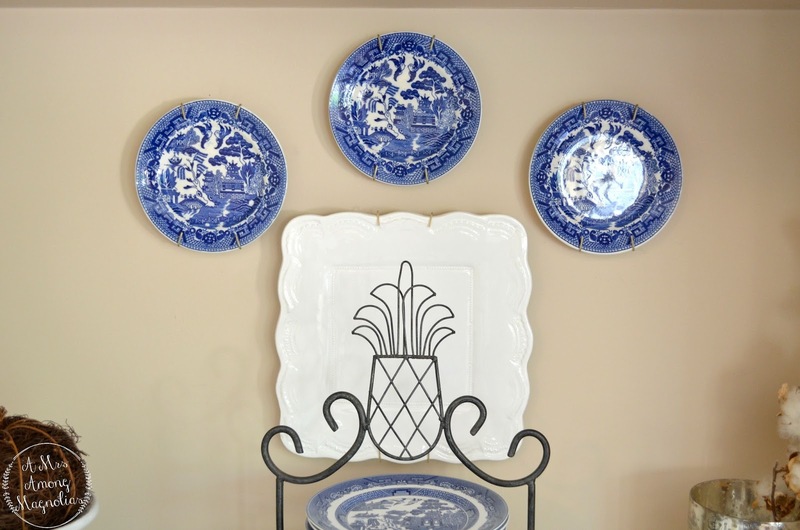 Do you have any pineapples in your home? Have a wonderful Tuesday! Too bad this week isn't a short week like last week was! Love that pineapple serving piece! You have the best luck with thrifting/antiquing!! Those are all so so cute! Thank you, that is so sweet! It seems that I can never find the one piece I am looking for, but I can always find things I wasn't even thinking about!